Woohoo, It’s finally Friday!! And to kick off the weekend I’m heading out for dinner with some great friends. For a change my outfit tonight is pretty much all black! To shake things up this year, I’ve been adding more colour to my closet. But I have to admit I never grow tired of black. Love this look Jackie! Who ever said you can't wear black in spring?! Black and white always make for a chic piece. I love the white paneling on your top. Love the look you look fab! as usual I am a sucker for black outfits so much so I have to force myself to wear colors and then capture it on my blog lol. Love, love this look. Black just always looks right. Loving this! Your line looks so awesome in this outfit! I love this Jackie! So sleek and chic! You are right too - color is great but sometimes there is nothing better than that classic black look! 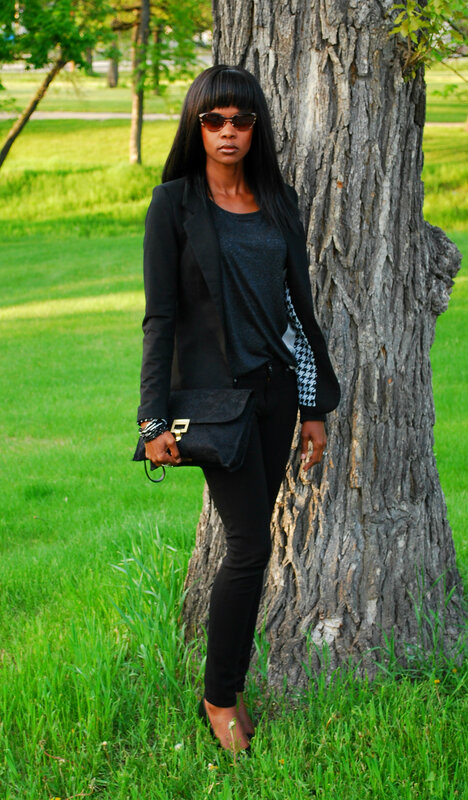 Thats so what I would wear..black and blazer always something you will find in my closet! great job! Love this! I saw that top at Target and thought it was so unique. Such a chic look, Jackie! Love it!! Hands down black will never go out of style. I love the hint of white in there as well.